This sweet book with its delightful illustrations addresses the attachment many children have for their blanky. It makes them feel safe when they are afraid, warm and cuddly when they aren’t well, and it’s a companion when they are alone. Pinky is Lucy’s blanky, made with love by her grandmother. It has a specific feel to it, its own smell, and like all much-loved blankies, isn’t washed very often as Lucy hates being parted from it. When blanky goes missing, it’s the ultimate tragedy for Lucy. She searches everywhere, even in places that blanky can’t be. Her feeling of loss is heartbreaking as loved ones try to replace her Pinky with another. But Lucy just wants Pinky back. Where can blanky be and what will Lucy do without it? 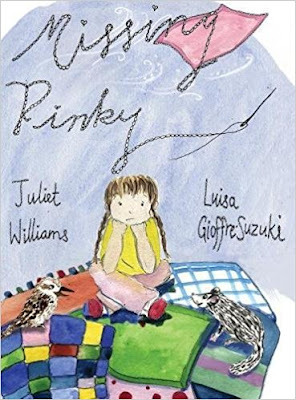 This is Juliet Williams’ second picture book. Full page colour illustrations by Luisa Gioffre-Suzuki bring the text to life. She has captured the emotions Lucy is experiencing with great insight, and the pages with the search for the blanket are exceptionally well presented. I loved the full page illustration of the night with Lucy and her brother sitting watching the moon and stars. The wistful atmosphere surrounding the children emanates from the page. The striking cover with a sad Lucy sitting surrounded by lots of blankets, but none of them hers, speaks volumes!